Fun In Franklin...Part 3: A Sweet Ending! Not only does Honey's have every kind of candy imaginable, it also has ice cream, malts, shakes and baked goods. Honey's is the kind of place you want to have your child's five year old birthday party. 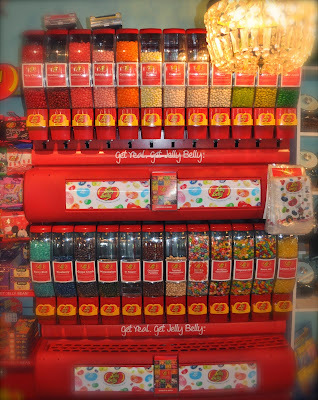 There is a reason we use the phrase, "like a kid in a candy store". And let me tell you, there is not a kid on the planet who would not love Honey's. I was way too full from the spread at Saffire to get any ice cream, but I did leave with a couple of fun candies. Do you remember Zotz? When I was a kid it was one of those candies I just could not resist. 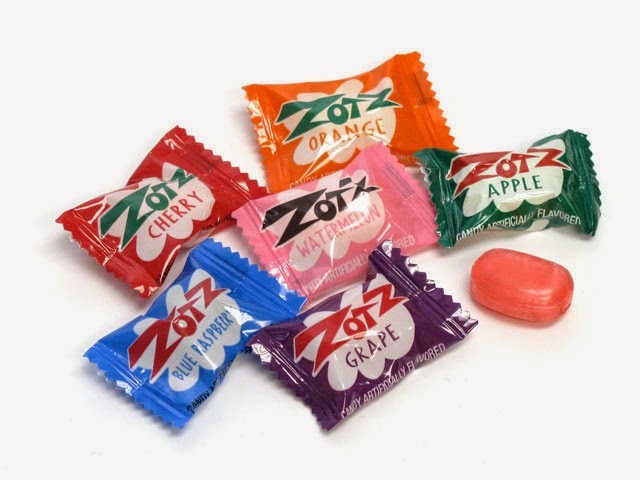 For those of you who have never had a Zotz, it is a hard fruit-flavored candy with a sour fizzy center. When you first pop a Zotz in your mouth, you are pretty clueless as to what is about to happen. It just seems like a fruity, hard piece of candy, but when enough of the outer shell melts or if you bite into it, you are in for a fizzy surprise. Think candy with an Alka-Seltzer center. It is a bit of a shock when all the fizzing starts. When I was in jr. high, I loved Zotz, so I felt pretty sure my boys would like them, too. The next thing that caught my eye was some jars of salt water taffy. The taffy was wrapped in wax paper and there were several different flavors. The one I just couldn't resist was a maple bacon flavor. It was just intriguing enough for me to grab a few pieces to take home. So, I filled my little sand bucket...that is the shopping basket of choice at Honey's...with a handful of maple bacon taffy and three flavors of Zotz, watermelon, cherry and strawberry. 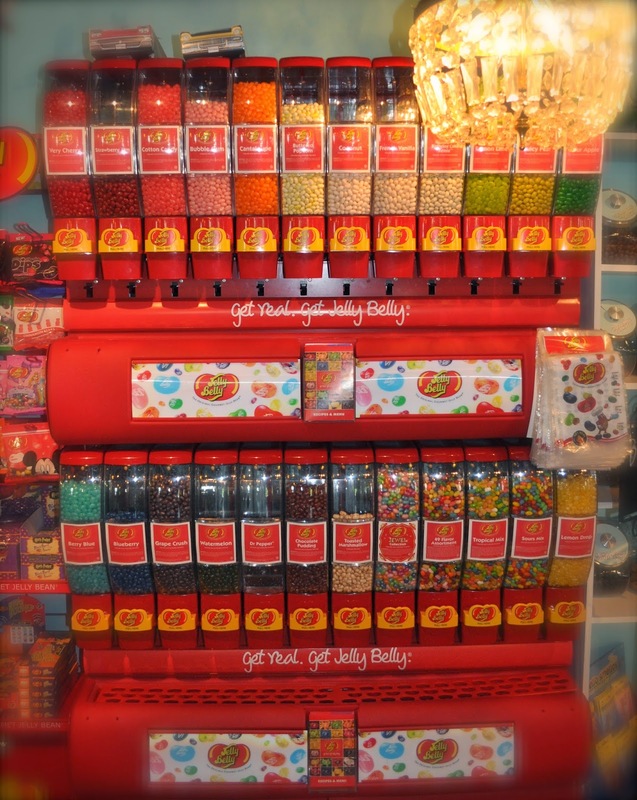 Every Jelly Belly flavor imaginable! While I was making my selections, Martha Jo and Buh were sampling some of the ice cream. Holly was filling up a bucket with some candy for her children. She found some cute Lego shaped candies she thought her little boy would love. We were all mesmerized by the colorful, glittering jars covering every table and shelf in the shop. Honey's is truly magical. If you take a trip to Franklin, be sure to visit Honey's. It truly was a very sweet ending to our fun in Franklin! So ends the story of our Franklin fun. It was over way too fast and we all want to come back and see more of what Franklin has to offer. I know Kelly has lots more ideas up her sleeve. Three Friends and a Fork and the whole family give Honey's 3 Sweet Yums UP!